Judy Coates Perez: Have you seen this? 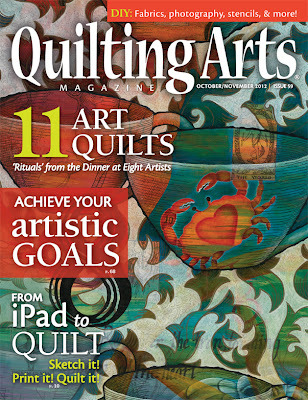 Pretty exciting to see the quilt I painted a year ago gracing the cover of Quilting Arts magazine! It's like coming full circle. What a year it's been. I am in the very midst of the transition the cards spoke of that inspired this piece. 8 of Cups: Moving on and letting go. Time to change direction in life. Dissatisfied and disappointed, wanting something entirely different, but not knowing what. Finding courage, taking time to rest and heal. If you are interested in seeing how the painting progressed and the symbolism of the imagery on this piece you can click here to read about it. Now I'm packing like crazy, sorting through 20 years of shared belongings, dividing things up and getting rid of unnecessary things (which is taking a lot longer than a typical move). I am streamlining, if that's really possible for an artist, lol, but I'm trying. I feel almost like I'm going through a birthing process, with the last year of gestation, knowing this time was coming, getting psychologically prepared, doing the work that needed to be done to make it happen. Now I'm in heavy labor, doing the hard work and soon life as I know it will be very different. I'll be moving on to the next phase of my life in a new place with lots of new adventures on the horizon! Kudos to Jamie Fingal and Lesley Jenisen for curating the Rituals exhibit that my quilt is hanging in at International Quilt Festival and the other 10 artists quilts from the exhibit that are featured in this issue. Hopefully I'll get a copy soon so I can see it and read Jamie and Lesley's interview. How wonderful to have your piece on the cover, it is a beautiful piece. I hope your new journey brings you new joys and creative endeavors. I was so happy to see your piece on the cover! Wishing you all the best as you go through the hard work of making your big move. How light and carefree you will be. Love, hope and light. I recognized the piece from watching you create it. But I had to look through the magazine three times to find where it was featured in there! Finally it dawned on me when I read the "8" in the title of the article. Sheesh! 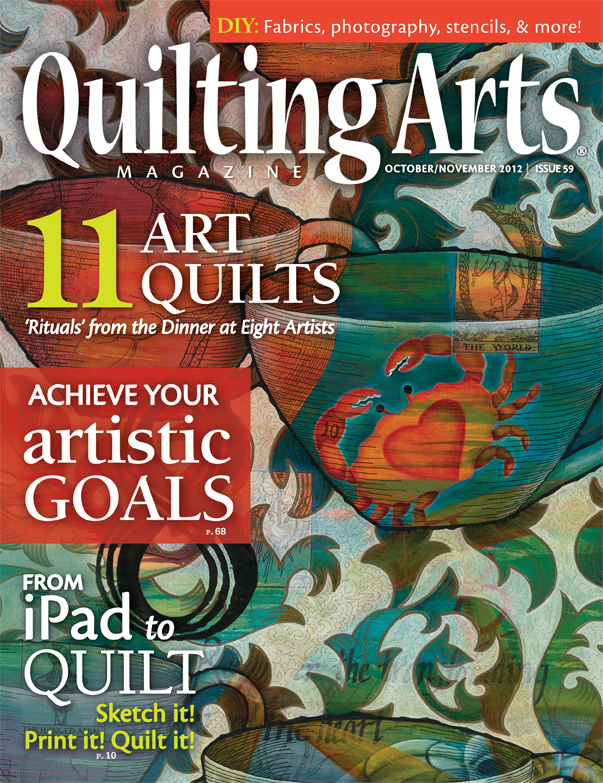 I am thrilled with the cover of this issue of QA as you are one of my very favorite artists....and this is the issue that my friends and I...the Creative Crones of studioQ...are featured in one of the articles...Your painting just makes it even more special for me!!! Congratulations cover girl! It is so great on so many levels. We'll celebrate in Houston! Can't wait to see you! This is a beautiful quilt. My friend is doing a painted quilt using FW inks...she is finding out that the ink is rubbing off...onto her hands and other parts of the quilt top in spite of the fact that she has tried putting in the dryer and also ironing it to heat set it. Have you experienced any of these difficulties? I haven't experienced that. Did she use pfd fabric? If not I could see that causing a problem with the paint binding to the fibers. She could try painting a coat of textile medium over the fabric to seal it. Setacolor calls it Lightening medium, Jaquard calls it colorless extender. I read the Liquitex brand of acrylic inks is permanent when heat set, but I havent done any experimenting to verify that. When I eventually get resettled I'm going to do a few brand comparisons.